Did you catch the BioTech trade – we did!! The Direxion Daily S&P Biotech Bull and Bear 3X Shares seek daily investment results, before fees and expenses, of 300%, or 300% of the inverse (or opposite), of the performance of the S&P Biotechnology Select Industry Index. There is no guarantee the funds will meet their stated investment objectives. 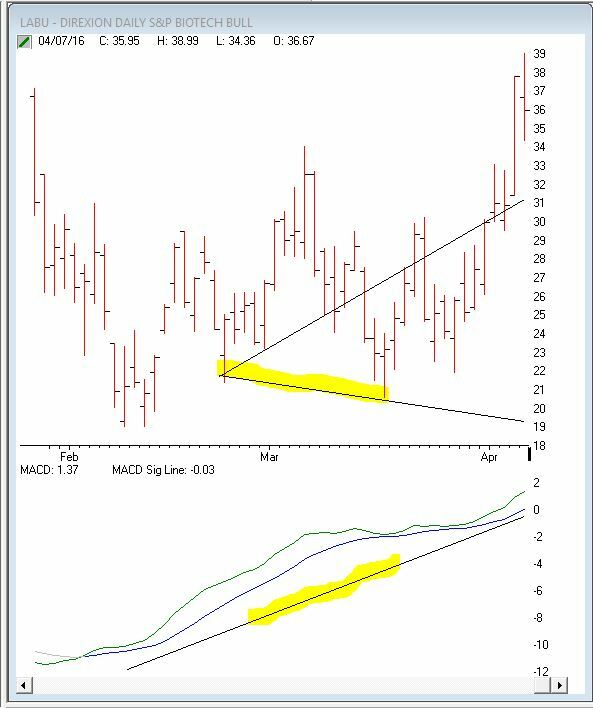 LABU & LABD are the tickers for the IBB index to either go up or down. I tweeted to my Big Game clients on March 21, 2016, that the ENTIRE Biotech sector was showing a reversal pattern. I warned all my subscribers both on Twitter & nightly updates & Tuesdays live classes about this sector! Ask anyone, they’ll tell you, this Biotech sector I have been pushing since March 21! I did not hear CNBC “experts” do this, what I teach is just a “tiny bit” better than the “experts”! Here’s what the IBB Chart looked like on March 21st. 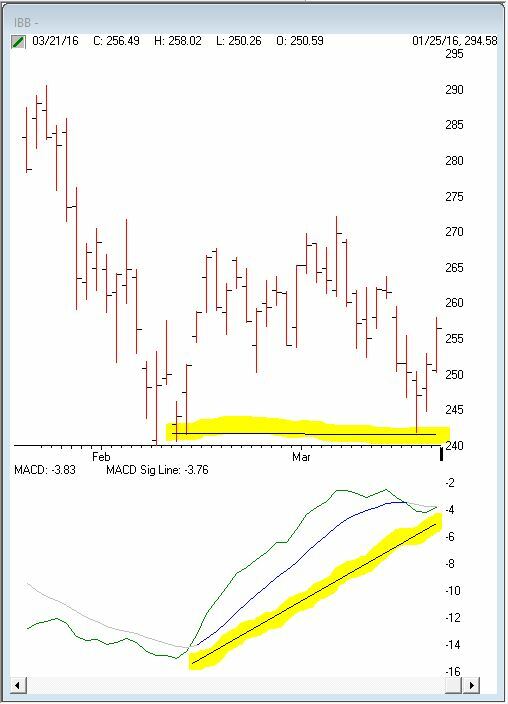 See the divergence on the MACD and the strong double bottom price pattern. THAT’S what I look for! Look at what happened to the IBB options by March 25th! Look at the strength of the divergence and where the divergence shows the price should be. At least $31 when it was trading at $20. It went as high as $39!!! That is over 60% on just buying the LABU outright-not options! I showed all of the moves that have taken place in these 3x ETF’s In fact, as of the past week or 2, the Biotechs have been number 1! LABU index up over 22% just today! AMGN, CELG & VRX OTM calls that were trading under $.10/share (my key strategy to buy under 10 cent options IF a strong chart exists) were all up many thousand % today!